For the album by Owen Temple, see General Store (album). "Country Store" redirects here. For the muesli product made by Kellogg's, see Country Store (muesli). A general merchant store (also known as general merchandise store, general dealer or village shop) is a rural or small town store that carries a general line of merchandise. It carries a broad selection of merchandise, sometimes in a small space, where people from the town and surrounding rural areas come to purchase all their general goods. The store carries routine stock and obtains special orders from warehouses. It differs from a convenience store or corner shop in that it will be the main shop for the community rather than a convenient supplement. General stores often sell staple food items such as milk and bread, and various household goods such as hardware and electrical supplies. The concept of the general store is very old, and although some still exist, there are far fewer than there once were, due to urbanization, urban sprawl, and the relatively recent phenomenon of big-box stores. The term "general merchandise store" is also used to describe a hybrid of a department store, with a wide selection of goods, and a discount store, with low prices. Examples include J. C. Penney and Sears. General dealers were established in the 18th and 19th century in many remote populated places where mobility was limited and a single shop was sufficient to service the entire community. Due to its close connection and confinement to its customers, general dealers often adjusted their sales offerings to the specific preferences of their community. General dealers existed, apart from mainland England and North America, in all colonies and generally in areas where settlers encroached communities that previously did not trade with money. In the colonies trade in local produce had existed long before official shops were opened. The growing need for imported goods, both from European settlers and the indigenous population, led to the establishment of a network of merchants, and subsequently to the creation of a money economy. 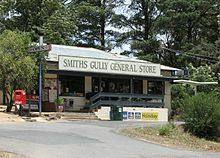 While a large number of general stores still exist in Australia, as in other parts of the world their numbers were greatly reduced by the advent of supermarkets. The oldest continually run general store in Canada is Trousdale's, located in Sydenham, Ontario, which has been operated by the Trousdale family since 1836. Socialbility has always been a feature, as locals come to chat as well as buy. Gray Creek Store in Gray Creek, Kootenay Bay, Canada is the largest and oldest general dealer in the Kootenay Lake region Enniskillen General Store in Clarington, Ontario has been in operation since 1840 and still continues today. Robinson's General Store in Dorset, Ontario, voted "Canada's Best Country Store", has been owned and operated by the same family since 1921. In the Dominican Republic, a colmado is the country's equivalent to a general store. Colmado literal translation is 'full to the brim' implying its great density of goods in a small space. The colmado is much more than just a general store, for it offers a social gathering point for the residents of the town or neighborhood. The colmado is an important institution in the Dominican Republic serving as an economic, social and political center for every small community. It is common for colmados to have loud Dominican music such as merengue, bachata, or salsa playing. A common pastime for Dominican men is to play dominoes and drink a beer at their local colmado on Sundays. Another particularity of the colmado is that they provide delivery services of their products straight to your house door. Products go from beers, snacks, toilet paper to a flash light or canned food. The Greek merchants in Egypt were called bakal. 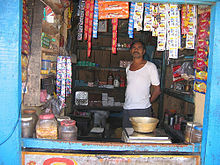 In India, a tapri is a regional version of a general store. It stores all home, personal, medical, and hygienic daily used products. Many Kirana shops sell products other from food, such as clothing or household items, stationery, toys, tools, and medicines. Small Kirna stores, which are generally located on the corner of streets and generally known as katta or tapri, sell cigarettes, tobacco, and tea. Due to its sparse population there are still a number of general dealers in Namibia, for instance the Solitaire General Dealer in Solitaire, an important stopover for tourists through Namibia's Namib-Naukluft Park. In Puerto Rico, a U.S. territory, several general stores ("colmado") have proliferated since the 1970s. There are still many general dealers in South Africa; the oldest is Oom Samie se Winkel (Afrikaans: Uncle Sammie's Shop) in Dorp Street, Stellenbosch. Oepverkoop is the oldest general dealer in Paternoster, Western Cape. Goodwood Museum in Cape Town displays the operation of a general dealer shop. Bodeguita comes from the Spanish language as a diminutive of bodega which means "small store" or "small warehouse". Traditionally, Bodeguita existed selling general merchandise, then they were replaced slowly by the chain store, the same way large US chains have practically eliminated the "mom and pop" store. Village shops are becoming less common in the densely populated parts of the country, although they remain common in remote rural areas. Their rarity in England is due to several factors, such as the rise in car ownership, competition from large chain supermarkets, the rising cost of village properties, and the increasing trend of the wealthy to own holiday homes in picturesque villages, consequently these houses which used to be occupied full-time by potential customers are often vacant for long periods. Of those villages in England who still have shops, these days they are often a combination of services under one roof to increase the likelihood of profit and survival. Extra services may include a post office, private business services such as tearooms, cafes, and bed and breakfast accommodation; or state services such as libraries and General Practitioner (GP) or Dental clinics; and charity partners such as Women's Institute (WI) coffee mornings held on the day most elderly villagers might collect their weekly pensions. Community shops have become popular in some villages, often jointly owned and run by many villagers as a co-operative. The Village Retail Services Association promotes the role and function of the village shop in the UK. Many modern village shops choose to stock items which draw in customers from neighbouring areas who are seeking locally sourced, organic and specialist produce such as local cuts of meat, local cheeses, wines etc. Corner shops are usually so-called because they are located on the corner plot or street end of a row of terraced housing, often Victorian or Edwardian factory workers' houses. The doorway into the shop was usually on the corner of the plot to maximise shop floor space within, this also offered two display windows onto two opposing streets. Many have now altered the original shop front layout in favour of a mini-supermarket style. Although it is common that corner shops found in the UK were former grocers' shops, other specialist retailers also occupied such slots and have suffered the same fate of being largely replaced by supermarkets and hypermarkets, such retailers as greengrocers, bakers, butchers and fishmongers. Many British television and radio series, especially soap operas, feature corner shops or village shops as cornerstones for community gatherings and happenings. Prominent examples are the village shop in Ambridge, the fictional village in the BBC Radio 4 series, The Archers, (1950–present day). Or the ITV1 soap opera Coronation Street (1960–present day) featuring a cornershop; it was owned previously by Alf Roberts the grocer, and after his death in the late 1990s was bought by Dev Alahan, reflecting this common change in British culture. The dying days and changing culture of the traditional British grocer were explored to great effect in the BBC TV comedy series Open All Hours (1976–1985), set in the real suburb of Balby in Doncaster; the shop front used for the street scenes in the series does actually exist in the area and is a hair salon in reality. The BBC Scotland comedy series Still Game has a corner shop as a recurring location where characters can meet and gossip; the actor who plays its owner, Navid Harris (Sanjeev Kohli), plays a similar role as Bangaram in the Radio 4 comedy series Fags, Mags and Bags which is set entirely in Ramesh's shop. The band Cornershop in part base their image on the perception that many convenience shops are now owned by British Asian people. In terms of British popular culture, these media representations give some idea of the importance attached to local shops in the national psyche and as a mainstay of community life. In the South the general store was especially important after the Civil War, as the merchant was one of the few sources of credit available until the cash crops (usually cotton or tobacco) came in. [page needed] There were few towns and very few cities, so rural general stores and itinerant peddlers were the main sources of supply. During the first half of the 20th century, general stores were displaced in many areas of the United States by many different types of specialized retailers in trading towns and small cities. But from the 1960s through present, many small specialized retailers have in turn been crushed by the so-called "category killers", which are "big-box" wholesale-type retailers large enough to carry the majority of best-selling goods in a specific category, like sporting goods or office supplies. However, the convenience inherent in the general store has been revived in the form of the modern convenience store. A few variety stores draw upon the concept of having a broad variety of goods servicing small communities where big-box retailers are absent; Dollar General Stores, in particular, draws its name from both the "dollar store" concept of having items at a fixed price point and the general store. ^ "North American Industry Classification (NAICS) 2002, "452 General Merchandise Stores (US)"". ^ "America's top stores". Consumer Reports June 2010, p. 17. ^ Lang, John Dunmore (1834). An historical and statistical account of New South Wales: both as a penal settlement and as a British colony. 1. Cochrane and M'Crone. pp. 236, 237. ^ "The Jewish Community". News history. Archived from the original on 11 June 2012. Retrieved 2 December 2011. Through their trading activities these merchant capitalists accelerated the transition from a subsistence to a cash economy. ^ Wild, V (1992). "An Outline of African Business History in Colonial Zimbabwe" (PDF). Zambezia. 19 (1). Retrieved 9 June 2011. ^ "Gray Creek". britishcolumbia.com. Archived from the original on 28 January 2015. Retrieved 25 January 2015. ^ "The Colmado in the Dominican Republic - JetSettlers Magazine". ^ Turner, Bryan (2000). Modern Egypt, Part Two: Orientalism (reprinted ed.). p. 251. ISBN 9780415209069. ^ Piyali Ghosh, et al., "Customer expectations of store attributes: A study of organized retail outlets in India." Journal of Retail & Leisure Property 9.1 (2010): 75-87. ^ "Solitaire Country Lodge". The Cardboard Box travel shop. Retrieved 1 July 2014. ^ "Historic Town of Character". Sustainable Stellenbosch. Archived from the original on 17 December 2011. Retrieved 2 December 2011. ^ "Paternoster Service Guide". capewestcoastpeninsula.co.za. Archived from the original on 3 June 2015. Retrieved 1 July 2014. ^ Material by Subject.htm "Catalog report" Check |url= value (help). South African Heritage Resource Agency. Retrieved 29 Oct 2010. ^ Lewis E. Atherton, The Frontier Merchant in Mid-America (University of Missouri Press, 1971). ^ a b Thomas D. Clark, Pills, Petticoats, and Plows: The Southern Country Store (1944). ^ Glenn N. Sisk, "Rural Merchandising in the Alabama Black Belt, 1875–1917." Journal of Farm Economics 37.4 (1955): 705-715. Kaynak, Erdener, and S. Tamer Cavusgil. "The evolution of food retailing systems: contrasting the experience of developed and developing countries." Journal of the Academy of Marketing Science (1982) 10#3 pp: 249-268. Lejoyeux, Michel, et al. "Prevalence of compulsive buying among customers of a Parisian general store." Comprehensive Psychiatry (2007) 48#1 pp: 42-46.